This is a hot subject so let’s not rake over old ground. You may not yet fully understand the mechanics of resistance but you will surely have heard how penicillin was discovered by accident only 70 years ago but has changed medicine indescribably; and how widespread resistance would result in cataclysmic consequences. Let’s not delve here into the whys and wherefores of whether this is a problem of veterinary medicine, human medicine, or both. You can read all those debates elsewhere. Instead, let us consider the social aspects of antibiotic supply to dairy farms and some very practical steps vets and farmers can take to demonstrate more responsible use. Antibiotic resistance is a social problem. Vets and medics are at the hub because they are gatekeepers to their supply. That makes vets pretty special and their roles are under scrutiny. We are where we are with imperfect use of antibiotics on dairy farms: there are too many commonplace examples of bad practice. But it is clear we are on a journey to somewhere different. None of us can predict exactly what that journey will look like. But we must consider how we ensure cows’ well-being and health is safeguarded whilst balancing our social responsibilities. This is a journey that vets and farmers must take together. Who leads who on this – vets or farmers? Perhaps a bit of both, depending on where you look. A recent Royal Association of British Dairy Farmers/ University of Bristol survey indicated that 97% of farmers regard the current AMR (antimicrobial resistance) crisis as something they need to play a part in tackling (RABDF, 2016). Yet only 52% of the same farmers had received recommendations from their vet on reduction in antibiotic use. Whose responsibility is it, actually, to ensure antibiotics are used responsibly on dairy farms? The vet should be the one in charge of treatment decisions as they decide what medicines a farmer can use. For example, only the vet can decide if a medicine can be used under the Cascade (“off-label”). The farmer has a responsibility to follow the vet’s instructions and ensure the correct withdrawal period is followed. But how should a farmer know what is risky for antibiotic resistance if the vet has not educated them? The RABDF/University of Bristol survey indicates that not all vets are meeting their dairy clients’ needs for advice and information to reduce antibiotic use. Like with climate change perhaps, there are “believers” and “detractors” regarding the risks of antibiotic resistance. Whether vets rate the risk as high or more real is likely to affect their prescribing behaviour. Similarly, farmers’ individual attitudes to risk are likely to affect how prudent their own antibiotic use is. Both dairy farmers and vets, due to the disproportionate amounts of antibiotics they are responsible for using/ prescribing, will make a far greater contribution to the likelihood of antibiotic resistance developing than the average citizen. So the behaviours of the few could have far-reaching effects on the many. So actually, our own private attitudes to risk are a concern for society as a whole. Vets and farmers should both be sensitive to this and see the issue from the public perspective. I often hear resistance to legislation and farm assurance guidelines (“Nanny state”; “interfering in our business”, etc. etc. ), but the reality is that being in a privileged position of responsibility, farmers and vets must take that responsibility seriously, putting the concerns of others before their own beliefs, if they are out of kilter. Even from a business perspective, putting the customer (dairy consumer) first is a given. An analogy is this: when I am a passenger in a car, I want the driver to stick to the speed limits and not send/receive texts, because even if he/she believes their driving is safe, I don’t! Going back a step further, how do any of us assimilate all the information to make correct decisions regarding the use of antibiotics? What informs our attitude to risk? In particular, how well informed is the average dairy farmer? In my own experience, it is very common for dairy farmers and stock persons to totally misunderstand what antibiotic resistance means (believing for instance that it is the animal that becomes resistant to a particular drug, not the bacteria). Furthermore, it is a rare farmer who understands how resistance occurs and therefore which behaviours are particularly risky. And finally, it isn’t uncommon for farmers to even misunderstand which of the medicines they have on their shelves are actually antibiotics! Vets’ education will necessarily ensure they are normally better informed, but a uniformed approach to decision making is far from assured. Research into over 3000 European vets’ prescribing behaviours indicates that decisions are based on a multitude of factors (De Briyne et al, 2013). “Responsible use” factors competed with “convenience factors”, “economic factors”, “society factors” (e.g. owner demand) and “professional judgement factors”. On the whole, farm animal practitioners placed marginally less emphasis on “responsible use” than their companion animal colleagues. But overall, all factors were considered similarly important by vets across different sectors and from different countries; professional judgment and responsible use factors were slightly more important than the others. In the UK there is no reliable data available for actual use of antibiotics on dairy farms, both in terms of overall amounts and certainly in terms of specific circumstance. The Veterinary Medicines Directorate has challenged the cattle sector to put in place systems to correct this, and the Cattle Health and Welfare Group (CHAWG), with assistance from the British Cattle Veterinary Association (BCVA), is working on solutions. In the UK, we have a relatively trusting legislative framework when it comes to supply of medicines to dairy farms and devising treatment protocols. That is to say, vets are trusted to prescribe and sell medicines to their clients and not to prescribe unnecessarily. They are also trusted to devise the best treatment protocols, including Cascade (off-label) use where they deem it appropriate. Meanwhile, farmers are trusted to administer treatments as per vet instructions and keep some prescribed medicines on the farm. This isn’t necessarily the case elsewhere. For example, in Japan, the state vet service specifies the treatment for every condition which must always be adhered to. In many Scandinavian countries, the vet must examine every individual animal before treatment can be given. In some instances, vets are not able to sell medicines at all and nor are farmers allowed to keep any medicines on farm. Some countries have more restrictive access to certain classes of antibiotics than in the UK. Or, vets sit in a dispensary all day and sell to the farmer whatever they ask for. That tends to be in less developed countries and represents the opposite end of the scale. The elephant in the room is that UK vet practices make a significant part of their income from the sale of medicines, including antibiotics. Therefore, it can be argued that vets have a direct financial incentive not to reduce antibiotic use. A Dutch report into the potential consequences of decoupling prescription from sale of veterinary medicines concluded that loss of medicine sales would significantly adversely affect the financial viability of veterinary practices but make very little financial difference to farms (Beemer et al, 2010). Decoupling was introduced by legislation in Denmark in 1995, and it was credited by the Danish government with a 40% reduction of antibiotic use in the agricultural sector within 12 months. More than 15 years later, the number of farm vets in Denmark has not reduced, although their income has. Unfortunately, however, the amount of antibiotic use has steadily increased again and substantial illegal imports onto farms are thought to be an additional problem (Beemer at al, 2010). In the Netherlands, since 2012, antibiotic use is monitored at species, veterinary and farm levels for cattle (De Briyne, 2016). It is also compulsory that each dairy farm has specific farm treatment plans which are devised by named individual vets each year and farmers are not allowed to deviate from these. Both individual vets and farms are bench-marked on their antibiotic use by regulators and these measures have seen a significant reduction in antibiotic use year on year (Jan Hulsen, personal communication). It is debatable how well our British system functions. A more “hands-off” approach by our government does rely on everyone playing the game and doing things right. Self-regulation is favoured in the UK and vets and farmers have an opportunity to shape that whilst tightening up their act. 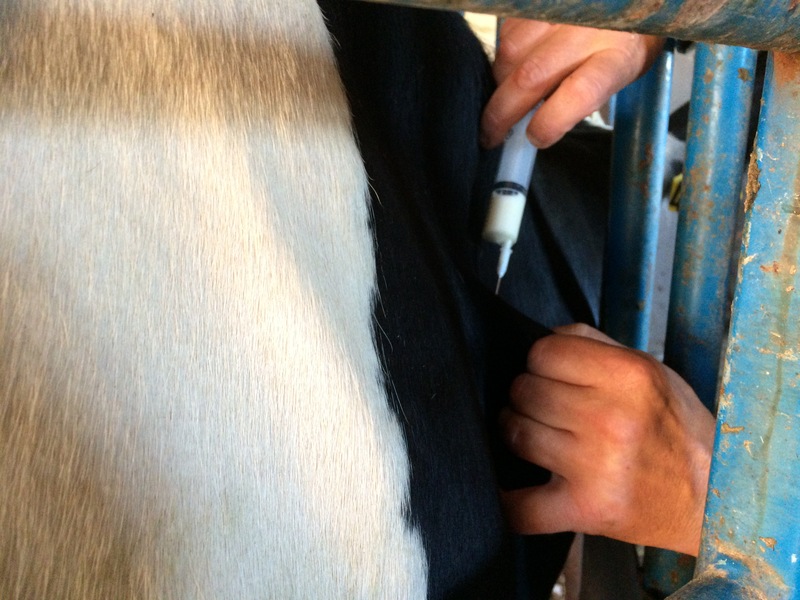 Some more forward thinking vet practices carry out periodic reviews and benchmarking of medicine use of their dairy clients but this is far from universal. Replace the need for the use of antibiotics in animals where possible with evidence-based and sustainable solutions to prevent diseases, and protect animal health and welfare. Reduce the annual usage of antibiotics in animals, whilst preserving animal health and welfare. Refine the use of antibiotics in animals, by ensuring the responsible and informed selection and correct administration of products to animals that have a clinical indication for treatment. A number of organisations in the dairy sector have some kind of stewardship plan in place. Probably, the direct-supply supermarket contracts are leading the way on this. For example, members of the TSDG (Tesco Sustainable Dairy Group) and the SDDG (Sainsburys Dairy Development Group) should be familiar with the aspirations for more responsible antibiotic use, including a reduction in use of the “critically important” antibiotics. The critically important antibiotics include 3rd and 4th generation cephalosporins and fluoroquinolones, and are ones which the World Health Organisation have deemed to be particularly important to safeguard against antibiotic resistance due to their value in treating difficult infections within human medicine. In October 2016, Dairy UK launched the MilkSure initiative which was developed in conjunction with BCVA. This is a training course for farmers (delivered by their own vets) to reduce the risk of medicine residues in milk. Whilst responsible use of antibiotics and antibiotic resistance are not the only drivers for this, they are important components. Two short cartoon videos are available to view and share freely both on the the MilkSure website (www.milksure.co.uk). These explain how antibiotic resistance develops and what the main steps are for dairy farmers to reduce the risk of this happening on their own farms. Owning responsibility for a problem is the first step to solving it. There is some way yet to go to ensure that antibiotics are used responsibly on dairy farms in the UK. To pretend otherwise is to bury one’s head in the sand. However, there are several individual and national initiatives which are either developed or in the process of development. Engaging with these is one clear way for vets and dairy farmers to demonstrate leadership in improving the responsible use of antibiotics. And showing strong leadership is definitely going to help our cause in the long run.